WordPressto is a bookmarklet that increases the WordPress wysiwyg Editor screen of WordPress by modifying the Interface, un-cluttering the view and doing few other things like adding the save and preview buttons.This makes it very easy to use the WP Editor. 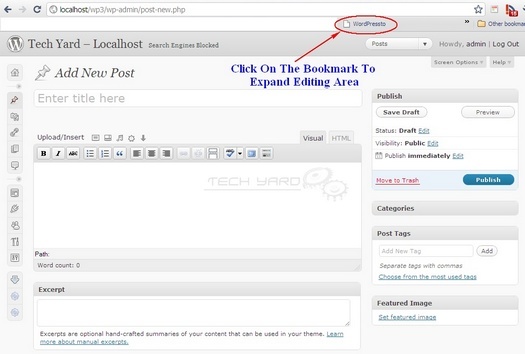 To use this, just add the WordPressto bookmarklet to your browser and click while your in the WP Post Editor Page and Vola you find the Editor expand with all the required buttons available. Here’s how the WP Editor looks after clicking on the Bookmarklet. 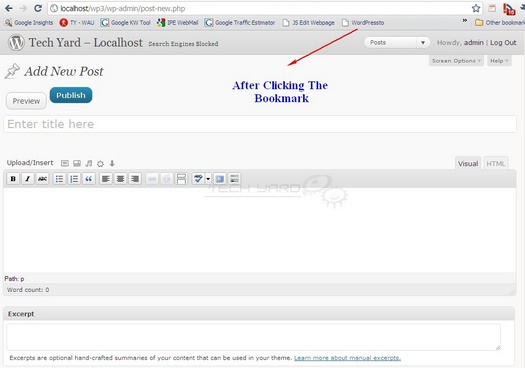 Add the bookmark to your browser by dragging and dropping the Drag and Drop Bookmarklet. Thanks for your comments.Yes, but that hides the title,excerpt and preview and publish buttons aswell.. whereas this bookmarks just removes the sidebar from the WP Add Post.